Hey everyone, I’m Cait, blogger behind Cait’s Plate, and I’ve been given the amazing opportunity to share my recipe makeovers with you all, right here on Health.com. I began blogging back in 2009 as a way to share my experiences with food. Coming from a large Greek family, cooking, baking, and food in general have always been a very big part of my life. As I got older, my family and friends would often request “tweaked” versions of classics to fit their specific dietary needs (from lactose free to heart healthy to diabetes friendly). As the list of requests grew and my interest in health and nutrition blossomed, I developed quite a knack for taking conventional recipes and working with substitutions to make them fit all lifestyles. I’m a firm believer that nothing is off-limits and that everyone should get the chance to try something at least once. I'll be sharing some of my favorites here, but please feel free to suggest any requests you may have—I’m always happy to experiment in the kitchen! So, let's get cooking! Going gluten free seems to be quite popular these days. 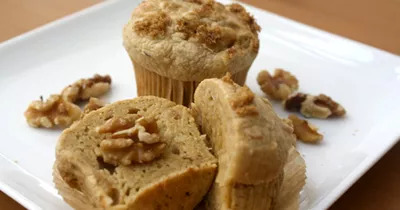 I've managed to tweak a classic banana-muffin recipe into a delicious version for gluten-free foodies to enjoy. 2 1/4 cups all-purpose flour — I replaced this with Bob’s Red Mill Gluten-Free All-Purpose Flour. 3/4 teaspoon baking soda — I substituted 1 1/8 tsp. xanthan gum here to bind, thicken, and combine the gluten-free flour to the other ingredients. In gluten-free baking, I’ve found it's important to include xanthan or guar gum to moisten baked goods that would otherwise tend to crumble. A good rule of thumb is to use 1/2 tsp. per 1 cup of gluten-free flour.